Eggplants are members of the nightshade family, along with tomatoes. They are classified as a berry and referred to as fruit. Also commonly known as aubergines (and brinjal in India), their slightly bitter taste is an enhancement to other cooked foods, but they are not consumed raw. Many traditional dishes are eggplant-based: Arabia’s baba ganoush, moussaka from the Mediterranean, and Italian eggplant parmigiana. The most common type is the large, deep-purple fruit that looks like a distorted egg. Colors can also range from green to white. In specialty and ethnic markets many exciting varieties include Japanese, Chinese, Filipino, and Thai. Some of these will be bitter compared to the American fruit, while others may be sweeter. Sizes will vary from long and slender to pea- or golf ball-sized. The peak season is short: August-September. They are available year-round from “forced” growing. Younger fruits and males will be the most flavorful. 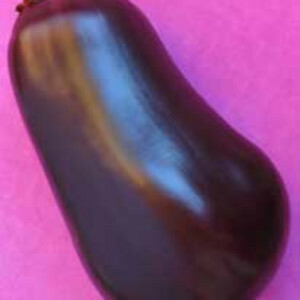 Female eggplants have more seeds, which heightens the bitterness. To identify males and females, look at the base (large end). The indentation, or “navel,” will be rounded on a male and straight across like a hyphen on a female. All fruits should be blemish-free and firm with a hint of sponginess. It is a matter of preference regarding weight, but eggplants that are lighter when compared to their size will have less seeds. They will keep for up to a week in the refrigerator, but taste best if used within a day or two of purchase. Wrap in plastic before storing in the vegetable drawer. Baby eggplants do not require peeling. Older fruits will have a bitter-tasting skin. The flesh begins to brown shortly after peeling or slicing. Bake an entire eggplant until the skin collapses and remove the pulp for dips and sauces. When frying, the water content in the flesh tends to soak up oil. Slice and sprinkle with salt. Leave for about 15 minutes to draw out some of the liquid and then dredge as usual.